I’ve recently noticed book awards being given out by fellow authors that also review books. That got me thinking. Why can’t I do the same thing? Sure, my awards really won’t mean much in the grand scheme, but it’s always nice to be recognized for our efforts. Especially when the trolls smash through our doors and proceed to stomp and tear our books apart. Even a small award, no matter how insignificant could brighten someone’s day. I hadn’t realized how many books I’ve read in the past year, until I started going through my posts, looking for all the books I rated with 5 feathers. Some categories I only one or two books I rated with 5 feathers. So let’s start with them. 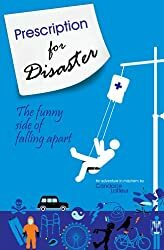 First Place goes to: PRESCRIPTION FOR DISASTER: the Funny Side of Falling Apart by Candace LaFleur.